Washington, D.C.—Engaging patients in the management of their own pain can decrease the risk of substance use disorder and help combat the growing opioid crisis, according to comments by Bruce Schoneboom, PhD, CRNA, FAAN, AANA appointee to the Health and Human Services (HHS) Pain Management Best Practices Inter-Agency Task Force, on May 30 and 31. Schoneboom is the Chief Learning Officer for the American Association of Nurse Anesthetists (AANA), which represents more than 52,000 Certified Registered Nurse Anesthetists (CRNAs) and student registered nurse anesthetists nationwide. The task force, which was required by the Comprehensive Addiction and Recovery Act of 2016 and appointed by HHS Secretary Alex Azar, is charged with determining whether there are gaps or inconsistencies between chronic and acute pain management best practices developed or adopted by federal agencies and professional associations. The task force will recommend ways to address identified gaps or inconsistencies, propose updates to best practices, and develop a strategy for disseminating this information to relevant federal agencies and the public. Schoneboom, who is the only nurse appointed to the task force, spoke about the important role CRNAs play in pain management, ensuring patients access to care and striving to reduce patient dependence on addictive opioid drugs. CRNAs are anesthesia and analgesia experts who are the hands-on providers of more than 43 million anesthetics to patients each year in the United States. 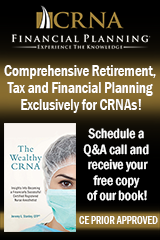 Many patients across the country rely on CRNAs as their primary pain specialist. Schoneboom told the task force that the AANA believes that moving from a unimodal approach of using opioid drugs to manage chronic and acute pain to a more patient-centered, multidisciplinary, multimodal, opioid-sparing treatment approach optimizes patient engagement in their own pain care, decreasing the risk of chronic pain as well as substance use disorder. He encouraged the task force to consider recommending removing artificial barriers and restrictions to practice that reduce access to qualified healthcare professionals like CRNAs. Read AANA’s Comments to the Task Force. AANA 2018 Election Results Are In! Ten members of Congress included the language in their list of priorities for NDAA – some making it their top priority – helping to ensure the language’s inclusion. The language was included as an Item of Special Interest in the Chairman of the House Armed Services Committee’s report for the NDAA, meaning it cannot be amended or changed before the bill becomes law. The AANA is grateful to its Federal Government Affairs team, Chief Learning Officer Bruce Schoneboom, PhD, CRNA, FAAN, the FPDs, members of Congress, and the U.S. Army Surgeon General for their efforts in helping to gain inclusion of language supporting chronic pain fellowships within the DoD. SunMed Holdings, LLC initiated a nationwide recall of 18,808 units of STAT-Check and Medline resuscitator bags which were distributed between February 1, 2018 to May 13, 2018. The patient port retaining ring of the affected bags may not fully seat which may allow the patient port to detach during use. See the recall announcement for affected lot numbers. There's Still Time to Submit a Video for the National Improvement Video Challenge! Sponsored by the Council on Patient Safety in Women’s Health Care, the National Improvement Video Challenge is an innovative opportunity to showcase how your institution implements a component of a patient safety bundle. Develop a short (three- to five-minute) video showcasing how a Council bundle has been utilized within your institution. The top three winners will be awarded monetary prizes and their videos will be shared on the Council website. To learn more about the National Improvement Video Challenge and submit your video, visit the Council’s website. Drug shortages continue to occur and disrupt the delivery of healthcare. In a recent statement, the US Food and Drug Administration (FDA) Commissioner Scott Gottlieb, MD discusses the FDA’s work to mitigate shortages of intravenous drugs, shorten supply distributions and better predict vulnerabilities. “The FDA is committed to taking new steps to address the root cause of more of these shortage situations,” Gottlieb states. The U.S. Food and Drug Administration (FDA) is launching an innovation challenge to spur the development of medical devices, including digital health and diagnostic devices, to help combat the opioid crisis and to help prevent and treat opioid use disorder. This new effort seeks to provide device developers an opportunity to work directly with the FDA to accelerate the development of innovative products, such as diagnostics to identify patients at increased risk for addiction, non-opioid pain therapies for acute or chronic pain, treatments for opioid use disorder or symptoms of opioid withdrawal, as well as devices that monitor the use and prevent diversion of prescription opioids. For more information on how to apply, visit the challenge website. Did you know that the American Association for Accreditation of Ambulatory Surgery Facilities (AAAASF) requires facility policies or protocols outlining how to handle a situation in which the anesthesia provider becomes incapacitated (AAAASF ASC Standard 400.020.016-.017)? The absence of such a policy outlining steps to take if the provider (or surgeon) becomes ill or injured during a procedure is a common deficiency cited by AAAASF. Recently addressing these citations, AAAASF noted that because ASCs have smaller staffs than hospitals, this rare scenario, if not handled properly, could jeopardize the patient. Dialing 911 alone is not sufficient. AAAASF recommends that such policies and protocols address ongoing patient monitoring, dressing open wounds, and an appropriate transfer plan. Names and contact information for other providers who could step in to complete the procedures are also beneficial. See the Becker’s Hospital Review article. September 21 - 25, 2018, Boston, Massachusetts. The 85th AANA Annual Congress is being held at the Hynes Convention Center in one of America's most storied and historical cities: Boston. Refresh and expand your knowledge with hands-on patient simulation workshops and expert speakers. 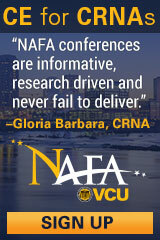 Network with colleagues from across the nation at the biggest CE event in nurse anesthesia. August 18-19, 2018, Park Ridge, Illinois. The Upper and Lower Extremity Nerve Block Workshop is designed to enhance your knowledge in the clinical sciences related to upper and lower block anesthesia. This program will expand the CRNA’s skills and expertise in upper and lower extremity nerve block anesthesia. Included with registration, all attendees will receive Upper Extremity Blocks, written by featured speaker Charles A. Reese, PhD, CRNA. November 9-11, 2018, Rosemont, Illinois. Mark your calendar. Business owners as well as practice and facility leaders will gain insight and confidence to lead the way in a rapidly changing healthcare environment. Registration opens in July. Watch for details. After analyzing three months of records at their facility, researchers at Duke University Medical Center report that cesarean section is one the top surgical procedures for excess prescription of postoperative opioids. The team discovered that 56 percent of patients undergoing joint arthroplasty and 42 percent of patients undergoing spinal fusion were opioid-naive when admitted to the hospital but opioid-tolerant when discharged, meaning they were taking more than 60 mg of oral morphine equivalents a day. Surgical child deliveries were also included among the top three procedures, with about half of these women taking no opioids upon hospitalization but taking more than 60 mg upon discharge. "The amount of opioids that C-section patients are being discharged with is quite remarkable, and it shows how exposure to opioids can be a driving factor in patients becoming addicted," says Neil Ray, MD, assistant professor of anesthesiology. "The next step is seeing exactly how much of these drugs patients are actually using. Many of them are actually only using a couple of pills after being discharged. So they don't need to be given 120 pills; they can be discharged with maybe just five or 10." From "Opioid Rx Rates Surprisingly High Following C-Sections"
Research out of France's Institut Curie offers evidence that hypnosedation—a pain relief technique that incorporates hypnosis, conscious sedation, and local anesthesia—can be used in place of general anesthesia. A team led by Aurore Marcou, MD, conducted a retrospective study of cancer patients who had surgery under hypnosis at their facility between 2011 and 2017. Breast cancer operations represented the bulk of the procedures, with gynecological surgeries, colonoscopies, and superficial plastic surgeries collectively accounting for the other 10 percent. Among the 150 patients included in the review, hypnosedation kept both the patient and the surgeon comfortable during 99 percent of the operations. "Hypnosedation can be proposed as a useful alternative to general anaesthesia in various types of surgeries including major breast surgeries," according to the investigators, who presented the findings at Euroanaesthesia 2018. "By minimizing effects of anesthesia, this technique is particularly valuable for vulnerable patients. Hypnosis benefits the patient as well as the caregivers." From "Study Reveals Hypnosedation as an Effective Alternative to General Anesthesia for Various Surgeries"
In Australia, researchers designed an open-label trial to compare anesthesia induction techniques in a population of 300 patients aged zero to eight years old. All participants presented with two or more clinically relevant risk factors for perioperative respiratory adverse events, but each was considered suitable for anesthesia induction with either intravenous propofol or inhalational sevoflurane. Children randomized in the study to IV propofol were much less likely to suffer perioperative complications than children assigned to inhalational sevoflurane, even after adjusting for age, gender, and other variables. The investigators say that, in light of the new findings, anesthesia providers should consider IV propofol for anesthesia induction in pediatric patients who are at high risk for perioperative respiratory adverse events. From "Inhalational Versus Intravenous Induction of Anesthesia in Children with a High Risk of Perioperative Respiratory Adverse Events"
Anesthesiology (06/18) Vol. 128, No. 6, P. 1065 Ramgolam, Anoop; Hall, Graham L.; Zhang, Guicheng; et al. Although clinicians worry that acrylic nails or nail polish sported by hospital patients can skew readings of their blood oxygen saturation (SpO2) levels, new evidence indicates that these concerns are not warranted. The accuracy of the readouts is crucial, since they inform decisions regarding medical intervention and influence patient monitoring in critical care and under anesthesia. Researchers in Cork, Ireland, found in a survey of 21 nurses and 55 doctors that nearly half have removed nail treatments in order to prevent them from interfering with readings from the digital pulse oximeters placed on patients' fingertips. The investigators also took SpO2 readings from 12 volunteers wearing different colors of polish and different brands of acrylic nails while under various physiological conditions. To mimic venous constriction, participants' hands were submerged in cold water for 10 minutes; blood flow was restricted using a blood pressure cuff to simulate venous congestion; and testing under normal conditions was performed as well. Contrary to provider fears, none of the nail treatments examined caused more than a 1 percent variation in SpO2 readings under any of the conditions tested compared to bare nails. Furthermore, none of the treatments dropped SpO2 below 95%, at which point intervention with oxygen therapy is recommended. "Experimental data indicate the nail treatments specified do not contribute significantly to a difference in blood oxygen readings, therefore have no clinical impact on patient care," conclude the investigators, who reported their findings at Euroanaesthesia 2018. From "Study Shows Nail Treatments Do Not Affect Readings of Patients' Oxygen Levels, Despite Widespread Concern"
While clonidine is often selected as an adjunct to local anesthetics for pediatric neuraxial block, its performance compared to other adjuncts is unknown. To investigate, researchers at China West Hospital conducted a meta-analysis of 15 randomized controlled trials that evaluated the safety and efficacy of clonidine versus other adjuncts to local anesthetics. Based on the evidence in the literature, postoperative analgesia was prolonged in children who received clonidine. These patients also were less likely to suffer from postoperative nausea and vomiting than patients who received other adjuncts. However, the findings also indicated that motor block may take longer to wear off with clonidine. From "Clonidine Versus Other Adjuncts Added to Local Anesthetics for Pediatric Neuraxial Blocks"
With postoperative nausea and vomiting (PONV) persisting as a frequent adverse effect of surgery and anesthesia, the Society for Ambulatory Anesthesiology has updated its Consensus Guidelines for the Management of PONV (CGM-PONV). Originally released in January 2014, the new document recommends evaluating baseline risk for PONV using a validated risk score based on independent predictors—which include young age, female gender, nonsmoking status, history of PONV or motion sickness, use of opioid analgesics, and duration of anesthesia with volatile anesthetics. The Apfel metric, for example, factors in gender, smoking status, postoperative painkiller use, and history of PONV or motion sickness to gauge the risk of patients undergoing anesthesia with volatile anesthetics. The latest iteration of CGM-PONV advises caregivers to use Apfel and other scoring tools to help guide decisions about the number and choice of antiemetics used for PONV prophylaxis based on a patient's baseline risk. For those at low risk, the new standards stipulate that a wait-and-see approach is appropriate. However, they call for one to two preventative interventions in adult patients at mild risk for PONV and a combination of antiemetic therapies or a multimodal treatment approach in patients at high risk for the complication. From "Consensus Guidelines for the Prevention of Postoperative Nausea and Vomiting"